I’m a big fan of Smashburger. Their burgers are high-quality, with great patties and fresh veggies, and they’re prepared quickly yet carefully. But how would they do with another kind of sandwich? A chicken sandwich, perhaps? Let’s find out!! Nothing “Mc” about THIS chicken!! Pretty well, it turns out!! The Chicken Avocado Club includes chicken (choice of crispy or grilled, so I obviously went with crispy) with avocado, bacon, lettuce, tomato, mayo and ranch dressing. The avocado here is outstanding. It’s freshly sliced to order, meaning it’s firm and flavorful, unlike the goop that other restaurants spoon onto their sandwiches (looking at you, Subway). The chicken was delicious white meat, the veggies were fresh, and everything came together well. 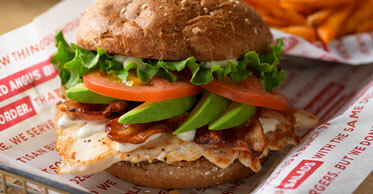 The Chicken Avocado Club runs for about $7. It sounds slightly expensive, but remember that this is the Cadillac of fast-food chicken sandwiches. You can taste the difference. If you don’t believe me, try it for yourself! !